Despite its booming property prices, leafy lanes and bourgeois reputation, Crouch End isn’t one of London’s dining hotspots. This is almost certainly due to its comparatively out-of-the-way, off-the-Tube location. It’s a 10 minute bus ride from Finsbury Park station which is an unimaginably arduous trek – if you’re a complete idiot. Walking down Crouch End’s Broadway reveals more than a few empty premises that were previously home to restaurants – victims of London’s hyper-competitive restaurant market. Hopefully, such a grisly fate won’t befall Heirloom. While the restaurant is tastefully decorated, the rear half of the dining room is a bit gloomy unless you go to the far back which has the benefit of a skylight. There are lots of bare surfaces, so it can become surprisingly noisy when full to the hilt with the chattering classes of north London. Another potential source of discomfort is the furniture – the chairs in the front half of the dining room tend to be far more rickety than those in the back. Reclaiming furniture may be the current fad in restaurant decor, but sometimes stuff is thrown out for good reason. Still, the smiley staff are friendly, efficient and comely. 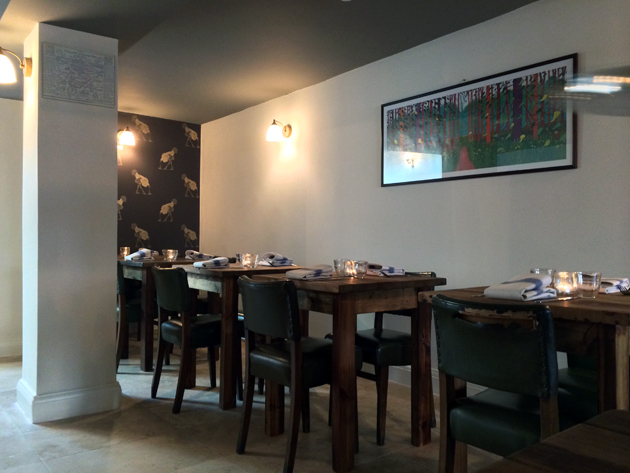 Heirloom’s tasting menu costs just £45 for seven courses which is surprisingly low by tasting menu standards. 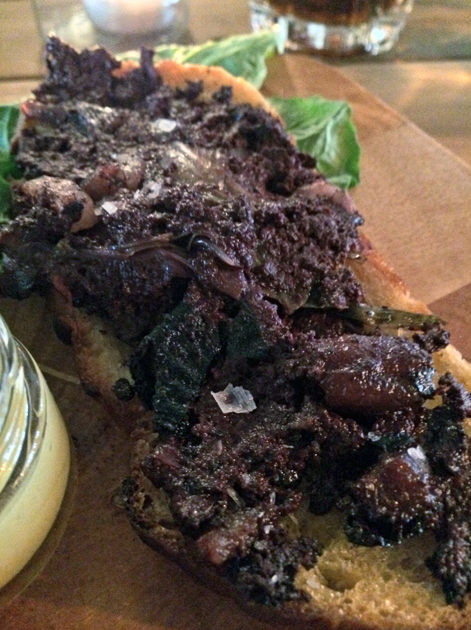 It changes almost daily, so if you do decide to eat at Heirloom then you’ll almost certainly have something different from what I had but what follows should give you a good idea of what to expect. The kitchen apparently sources vegetables from its own farm and prefers to use rare-breed meats and ingredients that are in season, an approach similar to the one purported at Fera at Claridge’s and other restaurants besides. My meal got off to a rocky start. 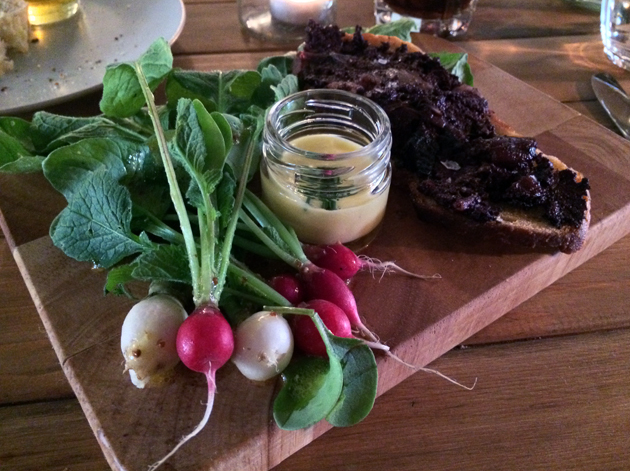 Whole radishes were served alongside some mayonnaise and black pudding on toast. While the crisp, lightly earthy radishes were meant to be dipped into the mildly creamy and salty mayonnaise, the small radishes were enjoyable enough on their own. 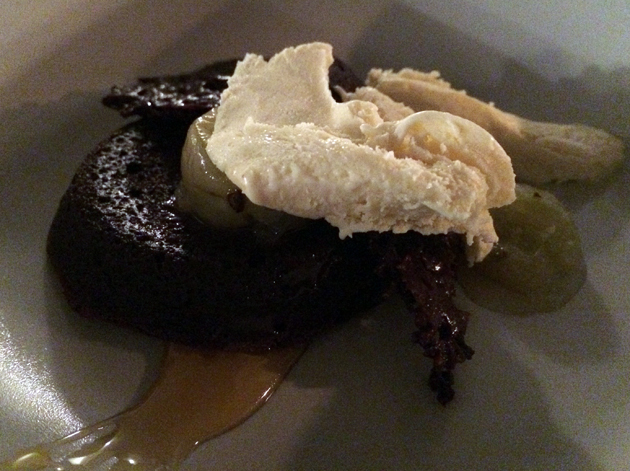 The black pudding was surprisingly light and also quite sweet due to the presence of caramelised onions. Although the radishes and black pudding were pleasant enough on their own, they didn’t really come together as a coherent whole. It all certainly looks very pretty. Crisp asparagus was paired with surprisingly light, wispy ricotta and a creamy mayo gently tinged with the sweetness of carrots. It’s a flavoursome combination made even better by the moreish meaty dribble of pork juices that gels with the vegetables to delicious effect. Vegetables not suitable for vegetarians. The heap of squid rings and tentacles were zingy fresh and had just the right amount of firmness. 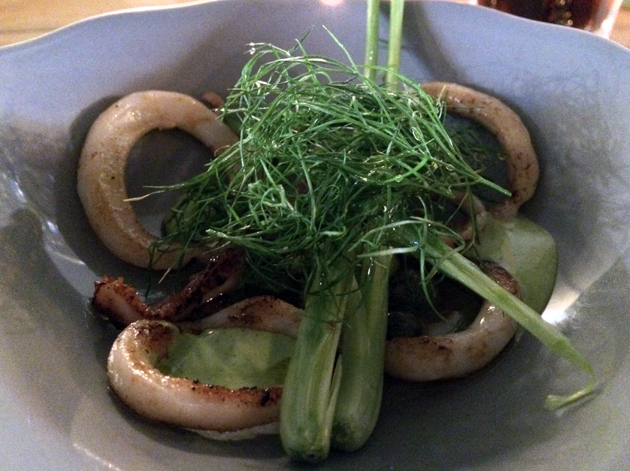 The squid was served in a moreishly flavoured oil that I couldn’t identify and also had an aniseed-esque flavour. Although the latter didn’t really compliment the distinctly nutty taste of the hazelnuts, it was at least an interesting contrast in bold flavours. Although the salty taste of the samphire accompanying the pollock was muted, the tender and flaky pieces of fish weren’t lacking for either scent or flavour. 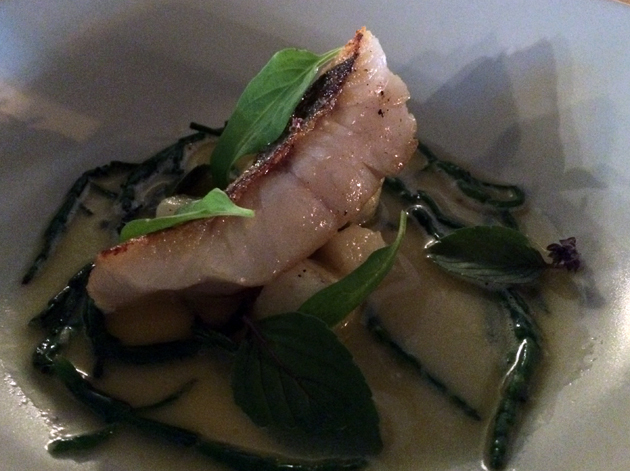 The pollock, along with some small and tender slices of potato, was served in a boldly flavoured and evocatively scented basil oil that instantly took me back to the summer gardens of my childhood. Don’t be a pillock, have some pollock. 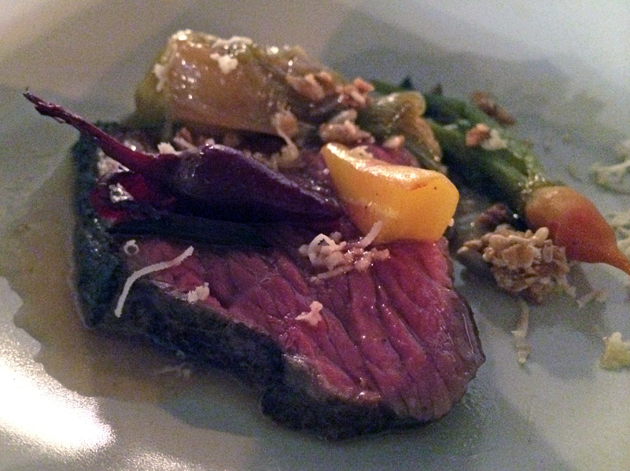 Chewy, nutty granola was a little out of place next to a tender fillet of deer cooked rare, but the beefy tang of the meat was still delicious – especially when paired with the mild sweetness of beets. The ricotta that accompanied the asparagus made a repeat appearance on the cheese board. Alongside it was a brie/camembert-style soft cow’s cheese, although accidentally biting into the rind left an overwhelmingly astringent taste that was hard to shake. 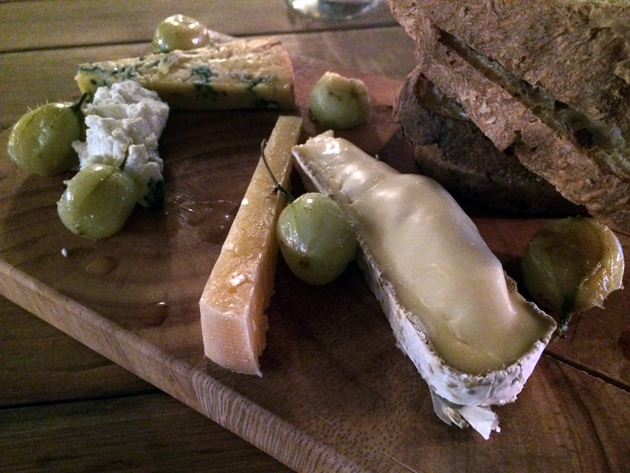 The blue cheese was creamy, mild and inoffensive. More interesting was the gouda-like hard cow’s cheese – aged and nutty, but with a more pronounced caramelish sweetness reminiscent of Old Amsterdam cheese. I’m never board of cheese. Although some will go gaga over the gooey chocolate ganache, I found it to be the least interesting component of a dessert that included a distinct but not overpowering lavender ice cream. The tart gooseberries and crunchy cornflake-like hazelnut brittle complimented the ice cream well, so much so that there was really very little need for the ganache. It’s time for gooseberries to make a comeback. Given the surprisingly low price of the tasting menu, it really makes very little sense to go a la carte – especially as the kitchen will offer to accommodate your dietary requirements. Choosing four courses a la carte costs almost the same as the seven course tasting menu and the small portions are really designed to be taken as part of a multi course meal. 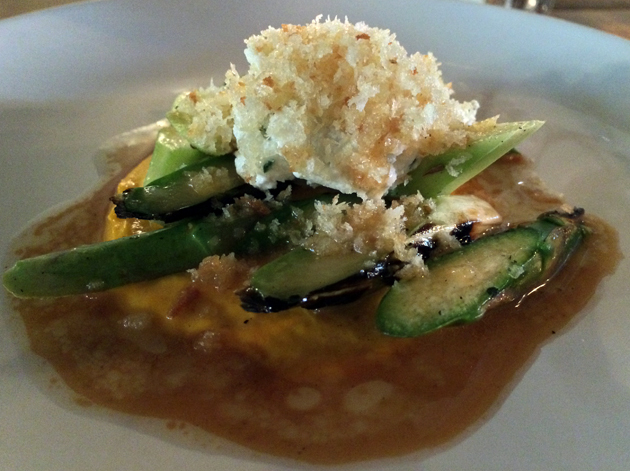 Still, I went a la carte for my second and final visit to see how well the kitchen coped outside its tasting menu comfort zone. I needn’t have worried too much. Lamb with grapefruit mint sounds and looks a bit daft, but it works exceedingly well. 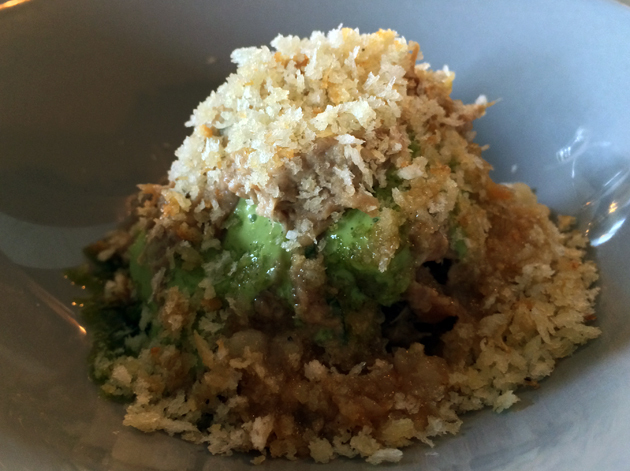 Tender, earthy strands of lamb were covered in crisp panko crumbs and a lightly sweet and minty sauce. Addictive. The oddest looking lamb dish I’ve had all year. So far. The bread stew was more like a soup, but was none the worse for it. The thin, opaque soup was bursting with umami and had an added layer of unctuousness thanks to some dollops of thin cream. The slightly chewy chunks of bread contrasted nicely with the light and tender, yet still satisfyingly meaty duck livers. The latter were unsurprisingly similar to pork livers in taste and texture, but were lighter and not quite as earthy. 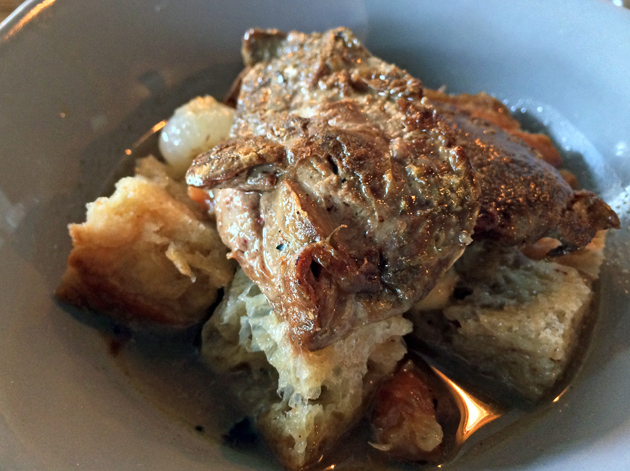 Described on the menu as a ‘poor man’s bread stew’. The rich would be lucky to eat this well. 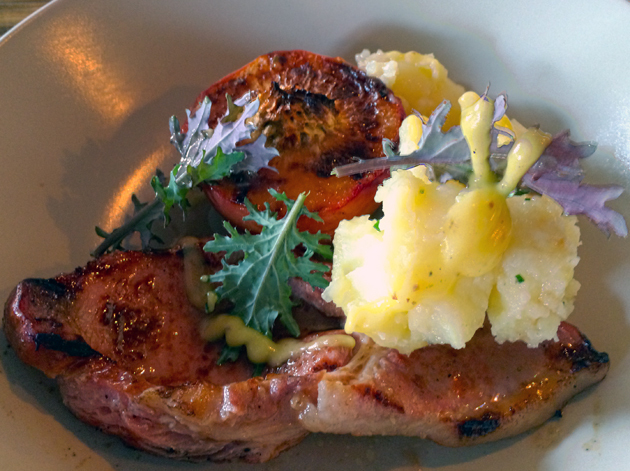 Disappointingly, the smoked bacon chop with roast peach was a mismatched pairing. The moderately thick slab of bacon was lean but very smoky. This smokiness was negated however when taken with the juicy, sweet, lightly seared peach. The hearty pork and tingly fresh fruit are best eaten separately. If there’s anything more traditionally English-sounding than treacle bread with clotted cream and rhubarb, then it’s probably Morris dancers complaining about the weather. 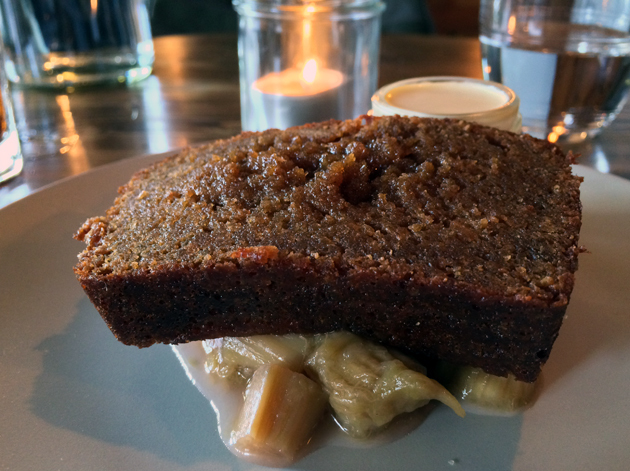 The bread was more of a sweet syrupy cake that went down a treat with the surprisingly sweet and peach-like rhubarb. Although thin, the rich clotted cream served on the side needs to be poured with caution to avoid overwhelming the relatively delicate flavours of the cake and rhubarb. A nonetheless delicious dessert. Although Heirloom’s unusual combinations don’t always work, when things do come together the effect is stunning. The food’s bold, simple flavours do more credit to Heirloom’s proclaimed sourcing principles and skilled execution than my words ever could. At its best, Heirloom simply outclasses Fera and I would much rather eat here again than at Claridge’s overhyped gastro-squib. Go now before everyone else does. Opening Hours: Tuesday-Friday 18.00-22.30; Saturday noon-22.30 and Sunday noon-18.00. Average cost for one person including soft drinks: £45-53 approx. Tags: asparagus, bacon, black pudding, blue cheese, cheese, chocolate, deer, fennel, ganache, gooseberries, hazelnut, heirloom, ice cream, lamb, liver, london, mayonnaise, peach, pollock, pork, radish, restaurant, review, rhubarb, ricotta, squid, treacle. Bookmark the permalink.